Nevermind Call of Duty beer, or even Fallout beer, for a new challenger is entering the ring. 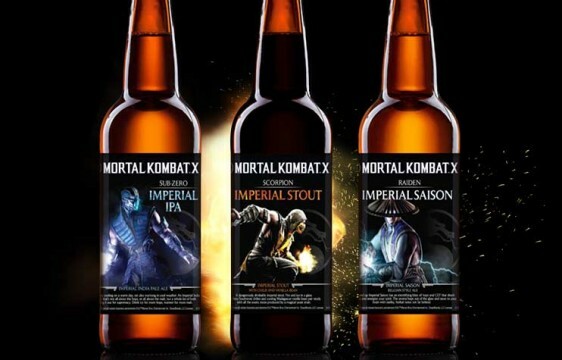 Warner Bros., Sound Brewery, and Global Beverage Traders have announced that a series of beers inspired by the fighting game franchise Mortal Kombat will soon be arriving to quench the thirst and rage of adult gamers everywhere. The upcoming brews include a “Scorpion” Imperial Stout, a “Sub-Zero” Imperial IPA, and a “Raiden” Imperial Saison. Global Beverage Trader maintains that each has “bold flavors aimed to match the intensity and excitement of Mortal Kombat X.” In other words, drinking any of these beers should, hopefully, be on par with taking a Scorpion spike through the throat. In a good way, of course. Along with their respective and dare I say fatal ABV, the official descriptions are listed below. A unique blend for great Imperial Stout brings both fire and ice into your glass. The fiery southwest chilies and cooling Madagascar Vanilla Bean pair nicely with the exotic notes produced by our own yeast strain. Refreshingly cooling on a warm day, an Imperial India Pale Ale that’s not all about the hops or the malt but is a whole lot of both fighting it out for your palate’s supremacy. Drink icy for more of the hops or warmer for more malt. This amped up Imperial Saison has a blast of hops and CO2 that will hit your tongue with a bang. The aroma jumps out of the glass with its earthly and herbal notes not far behind. Try one or try them all. Whatever you do, be sure to… finish them.